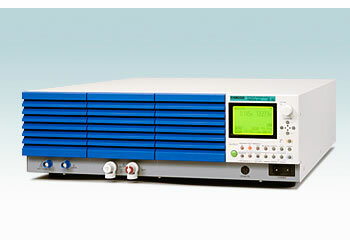 Kikusui’s new PBZ Power Supplies enable polarity change without changing terminals. Just vary the output control to seamlessly pass through zero. Four quadrant operation allows the power supply to act either as a source or load. Intelligent 4 Quadrant Bipolar Power Supply from KikusuiNot just power supplies, the PBZs are also high power function/arbitrary waveform generators with sine/square/triangular outputs and frequency (up to 100kHz) plus variable rise time (from 3.5uS). There are soft start/stop functions, ramp up/down, AC on DC and user programmable sequence function. Currently two models (+/-20V/+/-20A) and (+/- 40V/+/-10A). Units can be paralleled for more current. By adopting a “Switching + Linear” system, the PBZ is able to realize both drastic weight reduction as well as high speed and low noise operation. Since operation covers 4 quadrants, power can be both supplied (source) and absorbed (sink). The PBZ can also drive inductive or capacitive loads. 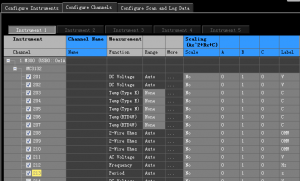 The unit also equips a signal generator function which enables waveform and sequence creation. The PBZ is also capable of synchronized operation which is required for voltage variation tests, and it can also be expanded for large current applications through master-slave parallel operation. In addition to the basic sine, square and triangular waveforms, the PBZ series is equipped with a user-defined waveform generating function that can register up to 16 waveforms. It allows the amplitude, frequency, start phase, frequency sweep and square wave duty to be set as needed. The 16 user-defined waveforms can be freely edited, and the original created and edited waveforms can be registered and easily recalled for use. The sequence function allows each waveform to be set as a single step, and a maximum of 1024 steps can be set in the 16 programs. A delay of up to 1µ s occurs at the start. This function expands the output current. It allows multiple units to be connected in parallel according to the required current. With 2 standard units of the same modeland the optional parallel operation kit, the user can easily complete the setup. 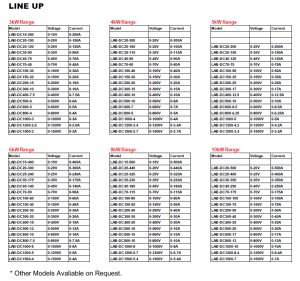 Although up to 5 units can be operated in parallel, if 3 or more units will be used, please consult us. This is a function unique to this product. Because the voltage is unipolar, this function is called “unipolar mode”. 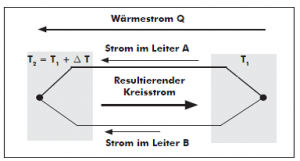 With unipolar power although the current flows in a single direction, in unipolar mode it is still possible to apply current in both directions (source and sink). As part of our on-going interest and involvement with our local community, Telonic Instruments Ltd are pleased to announce the sponsorship of the California U-18’s Girls football squad, as their goalkeeper is the daughter of one of our employees. Yes, there really is a California in the UK! The girls range in age from 15 to 18 and were formed by the merger of Reeves Rangers Vixens and California FC. They play 11-a-side matches in the North East Hants League which consists of ten teams from all over Hampshire and Berkshire. The team are part of the Eversley Sports Association, formed when Eversley Football and Cricket clubs joined forces with California FC and their training ground is based at a brand new facility developed with lottery funding at Eversley Cross, Hampshire. http://www.eversleyfootballclub.co.uk/. We will be keeping you up to date with their progress via our website. Telonic Instruments have introduced a new range of Hipot (Flash) and Insulation Resistance testers manufactured by Japan based Kikusui. Designated the TOS5300 the three models in the range are designed for use in Withstanding Voltage and Insulation Resistance testing to help ensure the safety of Electrical / Electronic components / equipment. Incorporating and innovative PWM amplifier that achieves high stability and has an input voltage regulation of.3%. The series offer rise and fall time control of the test voltage and a stable output which is unaffected by mains voltage variations, plus the ability to select 50 or 60Hz test frequency. Upper and lower current limits can be set within the range of 0.01mA to 110mA in AC mode and 0.01mA to 11mA in DC mode. AC test voltage is settable from 0.05kV to 5kV. D.C test voltages can be varied from 0 to 6kV. There are three models in this versatile range which consist of: 1. TOS5300 which is for withstanding voltage AC testing up to 5kV. 2. TOS5301 has AC and DC withstanding voltage test capability with AC up to 5kV and DC up to 6kV. 3. TOS5302 has 5kV AC withstanding voltage test capability, plus an insulation test function with test voltages from 25V to 1000V. 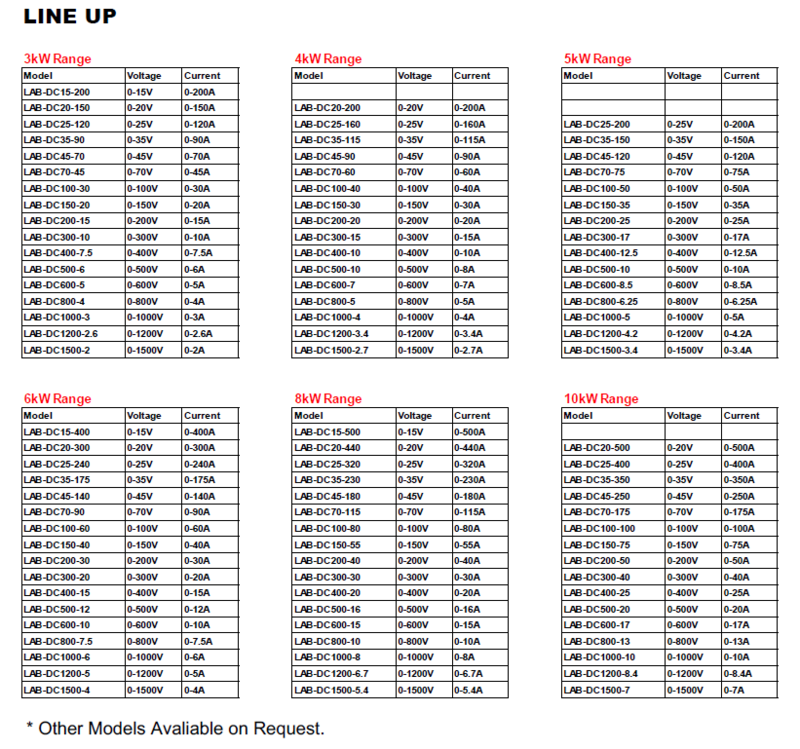 All models will operate from any global AC input voltages and frequencies; and are equipped with a USB interface. Easy to use controls and a large L.C.D. panel feature on the front panel. Weighing approx. 15kg’s These products have applications right across Industry and Research Labs. The PWX series is a CVCC programmable regulated DC power supply designed for a rack-mounted or bench use. To increase its mounting efficiency, it has a 19-inch rack width which is only 1U high with cooling running from the front to the back which means units can be stacked on top of each other. The series is equipped standard with USB, RS-232C, and LAN interfaces, which are essential for system upgrades. The series also has a virtual multi-channel bus (VMCB) function that allows it to be used efficiently for remote control and monitoring with 1-to-N and as well as with N-to-M in large-scale networks. In particular, the LAN interface is LXI compliant*, enabling you to control and monitor the power supply easily from a browser on a PC, smartphone, or tablet. You can also manage the power supply in a different building. 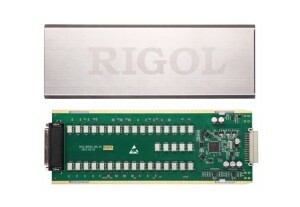 Rigol Technologies, leading instrument manufacturer, now adds more value for EMC Pre-compliance / advanced users, by including a free firmware enhancement. RIGOL now packs even more capability into the advanced DSA1000 spectrum analysers so customers get EMI Filter and Quasi Peak Detector option as well as the advanced measurement kit as standard. 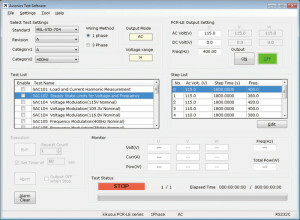 This enhancement now allows users to perform their own EMC Pre Compliance tests up to 3 GHz. 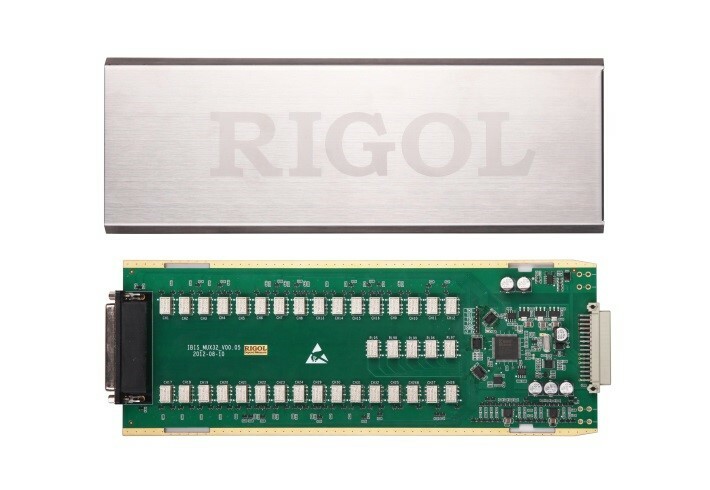 Users say the cost of a fully compliant EMC test instrument according to CISPR 16-1-1 will break the bank, and the find RIGOL’s solution to be only slightly shy of CISPR performance, so ideal for necessary pre-tests. DSA1030 and DSA1030A models are available with optional 3 GHz tracking generator and an optional VSWR bridge, so they can also be used as a scalar network analyser. A built-in pre-amplifier allows up to -148 dBm Displayed Average Noise Level (DANL), and with advanced standard functions like power measurement, Harmonic Distortion or TOI the DSA1030A analysers are ideal instruments for powerful and versatile high frequency measurements. 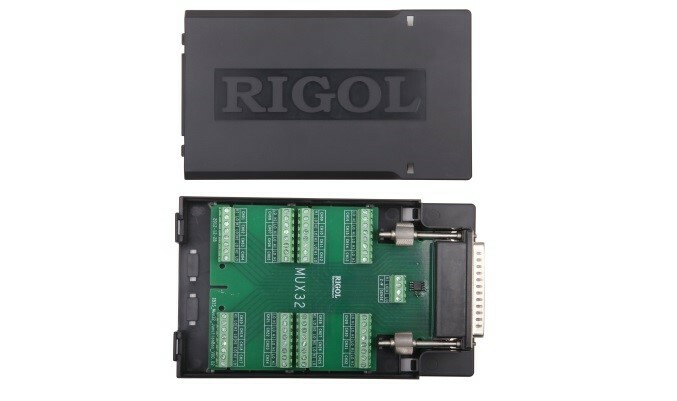 The use of a digital IF, which is standard for all Rigol spectrum analysers, helps minimize errors due to filter switching and reference level uncertainties; display errors suffered by traditional analogue IF designs when they switch between log and linear amplitude are minimised too. Today’s new freebies, previously sold for £400+ and now added by Telonic, include EMI Filter & Quasi Peak Detector and the integrated Advanced Measurement Kit making the DSA1030A-TG the ideal choice for pre compliance tests of boards, devices and components. Customers can now troubleshoot and test designs on their bench without having to schedule and pay every time at a full compliance lab. Pre testing like this is increasingly popular with engineers to stay within the EU-wide regulations for EMC during the design phase and avoids very expensive re-designs, reduces development time and accelerates your time-to-market. Doug Lovell, Sales Director with Telonic Ltd adds “RIGOL has already proven advantages in countless DSA applications… these new offers mean even better price-performance for our RF/EMC clients.” Brand new offers and prices are also announced today by UK Distributor Telonic at www.RIGOL-uk.co.uk and VSWR bridges can now be had with more functionality too. Offers are time limited. 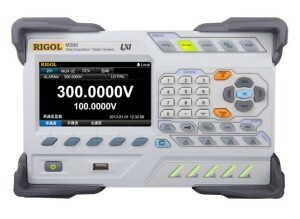 About Rigol: www.RIGOL-UK.co.uk is operated by authorised UK distributor, Telonic Instruments Ltd, the UK’s provider of choice for RIGOL sales and service. Telonic is an ISO9001:2008 Certified company. Rigol Technologies, Inc, an ISO9001:2008 Quality Management System and ISO14001:2004 Environmental Management System Certified company, is one of the worldwide leaders in test and measurement instrumentation. RIGOL’s premium line of products includes Digital Oscilloscopes, RF Spectrum Analyzers, Digital Multimeters, Function/Arbitrary Waveform Generators, and Digital Programmable Power Supplies in over 60 countries/regions on six continents. 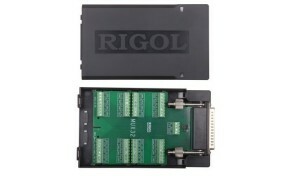 More datasheets and offers are available at www.RIGOL-uk.co.uk . 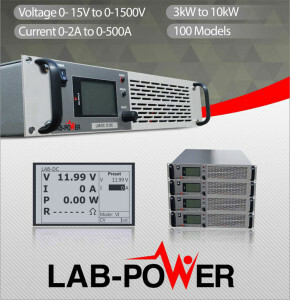 The Lab-Power LAB-DC Series are 19-Inch 2U Rack-Mountable Programmable High Power Power Supplies, they range from 0-15V to 0-1500V and 0-2A to 0-500A 3kW to 10kW CC,CV,CR and CP High Power Lab DC Power Supply. These Power Supplies use soft switching technology insuring the highest standards in reliability, efficiency and output performance. They are fitted with intuitive controls and a large graphical display indicating Voltage, Current, Power and Resistance. 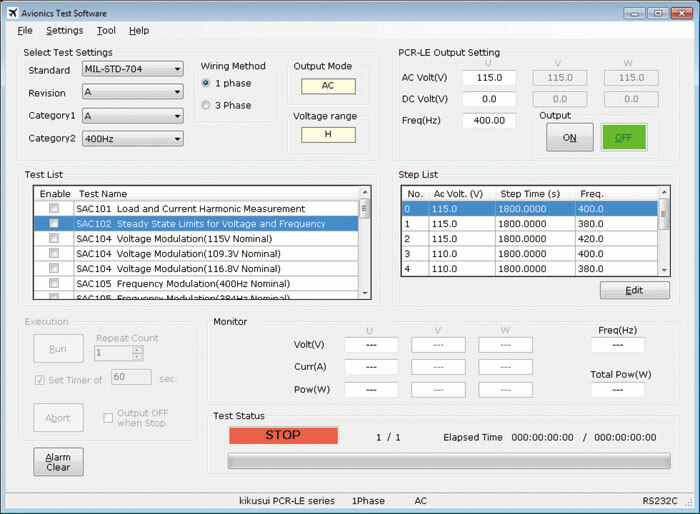 User Selectable operation modes include VI (Voltage and Current control), VIR (Voltage, Current and Resistance), VIP (Voltage, Current and Power) and PVsim for Photo Voltaic Panel Simulation. 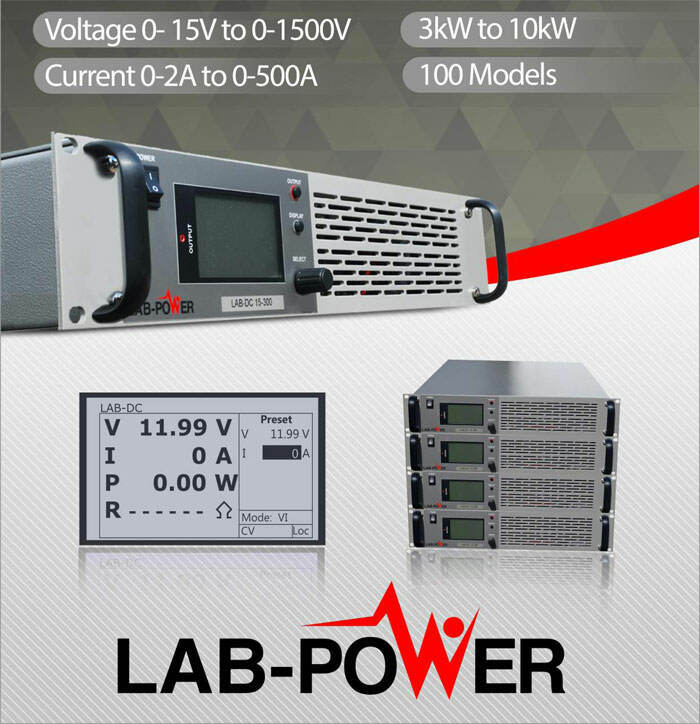 Features include: Front panel controls for voltage and current, over-voltage protection, over voltage and current Limit, adjustable output on rise time control for voltage and current, Isolated analogue and RS232 interface. Control software and Instrument drivers are also available. 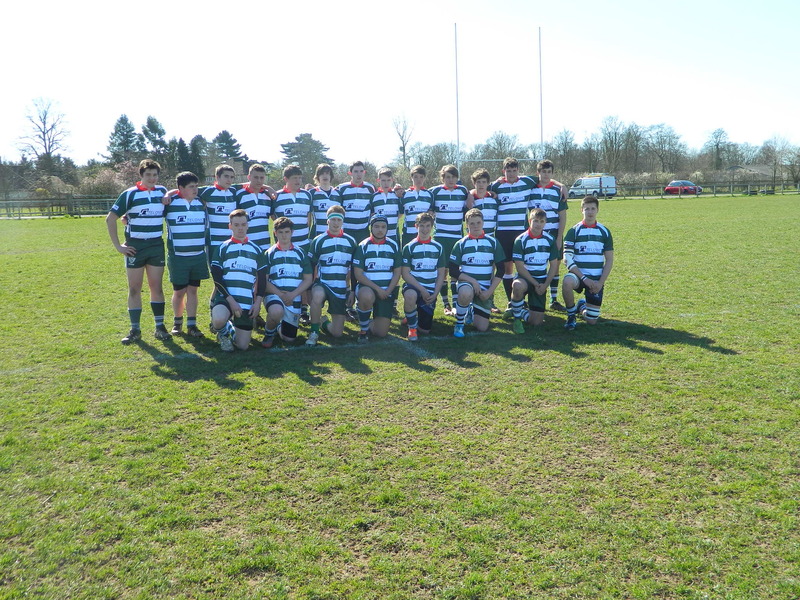 Telonic Instruments are sponsoring a youth team which is part of the local Reading rugby club and is designated CODE ( Centre of developing excellence) for youths of 17 /19 with the idea they progress to more senior teams. Reading rugby club was formed way back in 1898 when three senior officials from the RFU met in Pangbourne .From this inauspicious start the Berkshire Wanderers was formed. The club continued to thrive and shortly before the second world war some land at Holme park Sonning was purchased, and pitches were laid out. After the war a new club and stand was erected. In 1956 the club changed its name to the Reading Rugby Club in order to keep the town name after the founding of another local club which subsequently became the Abbey Rugby Club. Reading Rugby Club continues to expand and now includes two ladies teams. In 2013 it was decided to form another team to find and train male players between 17 and 19 for the first XV. This is part of the clubs structured progression. In 2012, the club was awarded the RFU Gold Seal of Approval for meeting all of the RFU’s requirements for the development of rugby. Doug Lovell, Telonic’s sales and marketing director comments ” A member of our long standing staff is a player who has migrated succesfully into the senior team from the CODE, and our policy is to support young people who are interested in sport. We can do this by supplying the full clothing kit and will continue to support them for the foreseeable future. Every electrical and electronic device, which will be placed on the market in the EU, must comply with electrical safety standards and also meet the requirements for electrical emissions both radiated and conducted and it’s susceptibility to external electrical emissions, both radiated and conducted. The exact standards that must be complied with depend on the product type. To demonstrate compliance with the required standards a “CE” mark is attached to the product and a CE Certificate of Compliance, listing the standards complied with must be enclosed with the product or be made available on request. For many electrical and electronic products environmental tests such as shock, vibration, temperature and humidity are conducted to stress the device under test and to accelerate ageing in order to assess the likely reliability of the product during its operational lifetime. These Tests are known as HALT (Highly Accelerated Life Test) and HASS (Highly Accelerated Stress Screening). HALT is applied to the electrical and electronic products during their design phase. The products will be stressed to achieve an accelerated ageing. This is done to find possible problems which could occur during the lifetime of the product so the device will be stressed beyond its specified maximum specs (electrical and mechanical). Problems found based on stress testing gives designers the possibility to change the design and the production process to improve the quality of the new product before its introduction to the market. With HALT and HASS it is possible to detect quality issues during the early design phase. This saves time and money, as the later in the developing phase problems are found, the more expensive and time consuming design changes become. To run the HALT test, the device is positioned on a vibration table inside a climate chamber. The tests normally run consist of steps, for example cool down or heat up, temperature change, vibration or combined stress tests. During all these test steps, the device has to be controlled and all functions have to be monitored and checked constantly during the complete test cycle. A so called automated test solution! Let’s look at temperature measurement which is normally done on different locations, on or around the device under test (DUT), to get a complete picture of the device temperature distribution during the HALT test. To be able to measure such a temperature profile within a climate chamber, you need a robust and accurate sensor. In this case a thermocouple is the best solution. A thermocouple is simple and robust, cheap and easy to handle and they have a large temperature range. The disadvantage of thermocouples is that you need a reference junction. The compensation can be done automatically by an instrument like a DMM which is included in the M300 test system. Most of the M300 switching cards include a CJC (Cold junction Compensation) so you can measure the absolute temperature of the device. In this case it eliminates the need for an external reference for example -“ice water” compensation. Also the nonlinearity of the thermocouples is not a big problem, because the built in multimeter will convert voltage into temperature for all different kinds of thermocouples (K,J, E, etc.) They differ in accuracy and temperature ranges. Thermocouples use the so called Seebeck Effectt, which is based on the physical effect that two different metals which, when connected, generate a voltage if the temperature is different on both sides of the metal. This voltage is very low, for example a Thermocouple Type K pro 1°C changes ca. 40µV. Therefore you need a voltmeter with high resolution and accuracy like in the M300 6 ½ digit system. For the complete test it is also necessary to be able to measure more than only the temperature, for example other parameters, such as voltage, current, resistance etc. It is also very useful to have math functions included in the system because you can define different types of sensors to measure e.g. pressure, movement etc. (mx-b) and also more complex sensors too. The Rigol M300 is a complete test solution with built in capability to measure a wide range of physical and electrical parameters. Measurements up to 256 points are possible for temperature, voltage, current and /or resistance with 2-wire connection, or half number of points with 4-wire connection and any combination of different signals. Besides measurements, it is also possible to control the whole process. With modules which have analog and digital outputs, we are able to react to process limits or influences, shut down or reduce or simulate the process later. Integrated CJC (cold junction reference) for reference temperature of Thermocouples Built in tables of voltage for temperature conversion High resolution voltage measurements down to 100nV Digital IO cards with up to 64 lines This is just a small selection of the built in functionality of the M300 system There are many industrial application areas where it is necessary to do measurements like the above: Consumer Electrical and Electronic Products – Especially Washing Machines, Dishwashers, Cookers, Microwave Ovens etc.… Automotive – Validation in temperature chambers of electronic parts… Aerospace, Train, Telecom – climate/temperature overview in the passenger cabin, Base-Stations… Power Plants – temperature profile of cooling towers… To make the configuration and measurement much more effective and easy to use, the M300 will be delivered with PC based Software UltraAcquire. UltraAcquire Pro is the extended version of the standard software tool and allows the use of more than only one mainframe. It enables extended graphic capability, data storage and more… Below you can see an example of a typical configuration. This includes voltage measurements, resistance measurements, frequency measurements and temperature measurements with different sensor types (PT100, Thermocouple Type K, Type E, Type N). With the software you can define when data is measured, how fast the scan should be, how long the measurement is done for and how the data should be stored. List of all different switching cards: MC3056: -DMM Module (6½ digits) MC3132: -32-channel Multiplexer MC3164: -64-channel Single-ended Multiplexer MC3232: -32-channel Reed Multiplexer MC3264: -64-channel Single-ended Reed Multiplexer MC3324: -20-voltage-channel+4-current-channel Mixed Multiplexer MC3416: -16-channel Actuator MC3534: -Multifunction Module 4x 8-bit DIO´s, 4x TOT totalizer, 4x DA converter MC3648: -4×8 Matrix Switch MC3724: -Dual 4-channel RF Multiplexer (later).